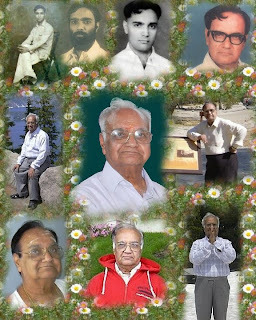 My dad, Dr. K. V. Swamy passed away on July 19, 2010. He was 80 years old, and lived a fulfilled life leaving behind even great grandchildren. I felt like sharing a brief history of his life and some memoirs. He was born in 1929, at a village called Thyagarajapuram, located in Thanjavur district in the state of Tamil Nadu in South India. His ancestors lived in that area adjoining the Cauvery river for many generations, though at some point in history one of them must have migrated from North India, since he belonged to the Vadamal Iyer (translates to North Aryan) community. He was the 7th child, and all his prior siblings had died due to some reason such as disease, accident or other. He also lost his father when he was about 8 years old, and his mother brought him up with stretched finances. This experience taught him the value of money, that in later life made him prudent managing his finances and quiet philanthropic pursuits. He went to school in nearby towns that required miles of walk and train commute, and passed SSLC (Xth grade). He was mentored by his maternal uncle Dr. V. R. Murthy, a pioneer of homoeopathy in South India, who had started the Indian Institute for Homoeopathy and BAHOLA (BArat HOmoeo LAboratories). He joined his uncle's institute as an assistant in the early 1950s, and through hard work, sincerity and perseverence, rose quickly to a leadership position managing several aspects of his uncle's business. After a decade, he moved on to venture on his own in 1962 and started the Madras Homoeo Pharmacy and clinic in T-Nagar area in Chennai (Madras). He also wrote an examination and registered as a medical practitioner with the Andhra board of Homoeopathic Council. His initial patrons were the street vendors in the area, who would forgo treatment for even basic illness like fever or cough, since they couldn't afford even cough drops or fever pills. They had heard homoeopathic medicines were cheaper, and would give it a chance. He would sometimes give the medicines for free, which was the only source of his revenue, as he never charged a consulting fee. Word spread, and the middle class communities in the area became his patrons. Later, the rich and famous from India and abroad also became his patrons, resulting in around 100 patients a day, and long waits for appointments, even over a week. Even when demand picked up, he maintained the same revenue model of charging only for the medicines. He was popular not only because of his skills, but also because he was jovial, multi-lingual and approachable to his patients. When he visited the USA, he learned a lot about computers, printers, Internet, and even enrolled in an adult education class in his late sixties! He was a regular shopper at Fry's and stores like OfficeMax during his visits to buy a range of electronic and office supplies. He setup a system back home, and used it actively to keep in touch with patients over email, and print office documents. In this sense, he was even a good engineer! Even on his last day, couple of hours before his death, he sent some emails to his friends - they were shocked to see a follow-up email from the family announcing his demise. He had traveled India widely in his younger days, and the US in later years. He liked the discipline, clean and systematic life in America. Other than the typical first sight and experience of freeways, signals and sidewalks, code enforcement, parks and libraries, he found a few things jaw dropping. Once, he found that the auto insurance paid for rental car after an accident, while my car was being repaired. Further, the repair shop picked up the rental tab, when it was taking longer than a week. Finally, when the car was repaired like new, he was stunned by the workmanship and service. He had only difficult experiences with Indian insurance companies and cheating auto repair shops, so he was very pleased to see things could indeed work so well. He was also impressed with the relatively easy return policies and customer friendliness at the stores. Once, he forgot to take $10 change from the cashier at Target, and realized only when he got home. We called the store and explained, and they refunded him later that evening, probably trusting his age and looks. As he got older, he cut down his work hours, but still managed to spend a few hours at the clinic. He also contributed to development of homoeopathy by leading activities in the Tamil Nadu Homoeopathic Council, and mentoring new homoeopathic doctors in opening their own clinics. He had completed 48 years of service at his clinic until his last day. on July 19, 2010. He leaves behind a large family that includes his wife, four sons and a daughter, nine grandchildren and two great grand children. As a husband and father, he was proud that he had done his duty to provide a comfortable life for family and settle his children in good lives. We are proud too, that he lived an accomplished life in many ways! Thanks for sharing....... pray god for his soul to rest in peace. Great Tribute to your Father!i am deeply touched after reading this....no words or comfort are good enough to replace the loss.May his soul rest in peace !